It's a slow news day, Jarno is busy jumping instead of scouring YouTube, so I thought I'd post that the dates for the Antonov Boogie 2009 have been announced by the organization. Unfortunately it looks like they haven't been able to get the AN-72 again this year, nor is it going to be held at Cochstedt Airport, which is too bad. It should still be a fun boogie with good vibes, great food, and an organization that works like well oiled clockwork. 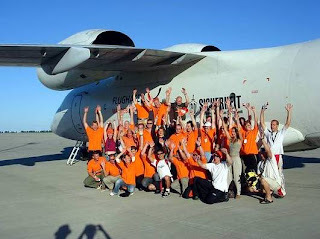 We take off again in 2009 und like to invite you to the 5th annual Antonov-Boogie. This year the event will be held at Magdeburg airport, about 30 km north of Cochstedt. The new dropzone can be reached quite easily and quick via the highways A2 and A14 or by train. Everything is possible; we will provide you with the established mixture from all types of skydiving combined with the unique flair of jumping out of a russian aircraft in the wild east of Germany. Top LOs will take care of all skill levels and offer you the best support; you don’t have to worry about anything and can enjoy your jumps. Furthermore, we offer you the possibility of beach-, water- and nightjumps throughout the boogie. 2 Antonov tailgate twin-turpboprop carrying 44 skydivers, climb to 14,000 ft. in less than 10 minutes. Within the next couple of days we are going to send you further details regarding the event and the registration.